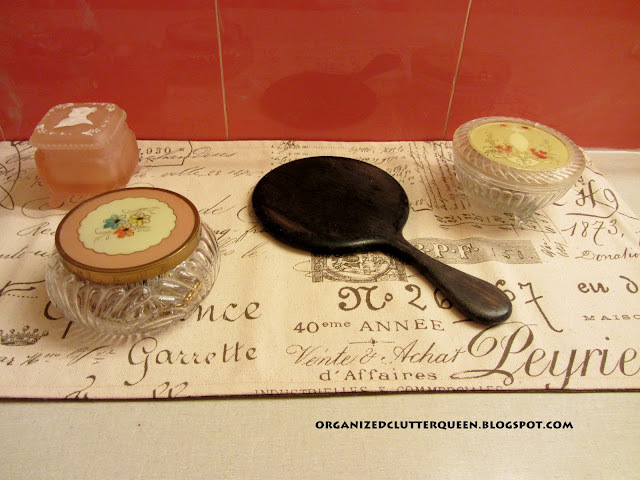 This is the third post in the "My Vintage Bathroom" series. I am going to concentrate on the countertop vanity items in my bathroom today, and the fourth and last bathroom post will be the full reveal. The last post will also feature past photos of my vintage bathroom with other color schemes and collectibles. First of all, my vintage bathroom has a vintage custom vanity that is 10 feet long. That much space has to be decorated, even in a bathroom! The French Script runners under the vanity items in the photos were purchased and custom made for my bathroom from a vendor on Ebay. I purchased most of these items at rummage sales, but even at antique stores, they are a relatively low priced collectible. 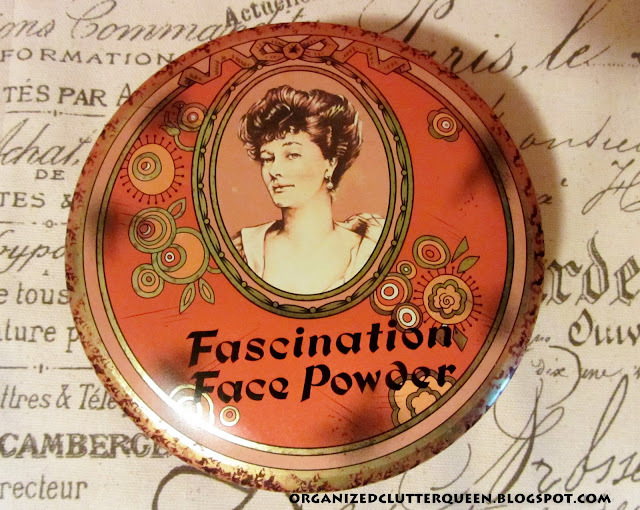 This Fascination Face Powder tin was the first in my collection. I picked it up because it was the color of the bathroom tiles. It is made by Daher Decorated Ware. This one is also a Daher Decorated Ware, England. This one is a Lavender Bath Powder tin from Langlois Inc, USA. Maker unknown on this slightly "risque" tin. I am not even sure if this is a powder tin. It could be a candy tin. The flowers matched the bathroom tiles so I purchased it. It was a replacement tin for a very vintage tin that had been cleaned one too many times. Using collectibles in the bathroom can ruin them. Hairspray collects on the vanity tins and using baking soda to remove it sometimes removes the finish little by little. 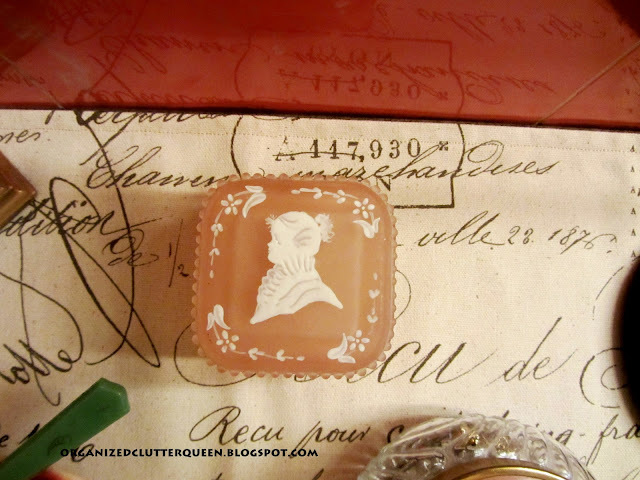 This little vanity jar is marked Westmoreland Glass. This vintage vanity jar is unmarked. Also chosen for the colors. Unmarked vanity jar, also chosen for flower color. This is the other side of the sink counter. Vintage vanity tins and jars for a vintage bathroom! Lovely collection. I have been looking for pretty jars to store in my dental cabinet, but the tops wouldn't be visible. Much prettier the way you display yours. I love your collection. What a fun thing to look for and collect. What a cute collection. 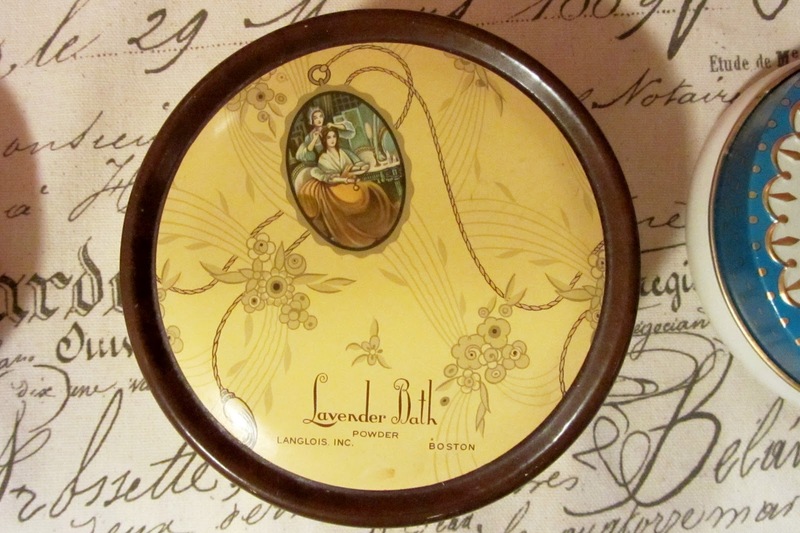 Love the lavender bath tin. 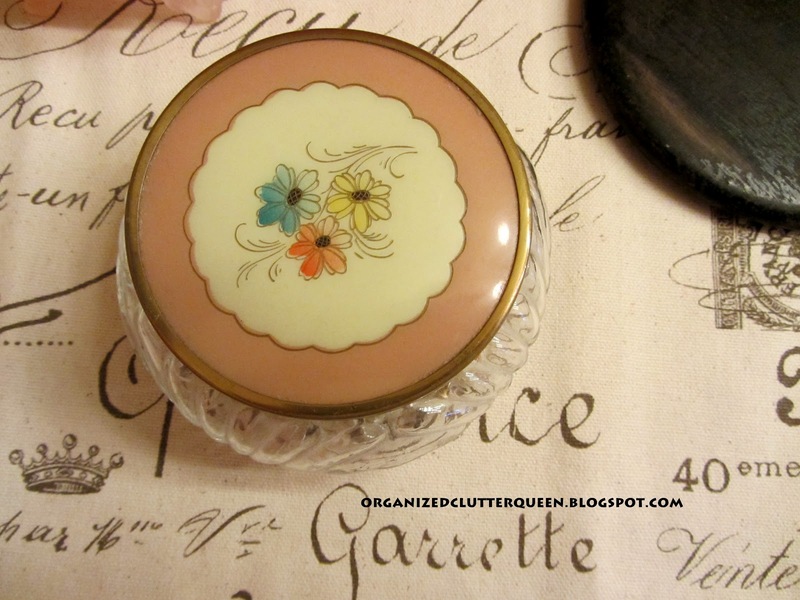 You have a beautiful collection of vintage powder tins and vanity jars. Love the attention to detail these items provide. Those are the cutest tins Carlene. they look perfect on your vanity. thanks for sharing with the newbie party. Just love all of your knick knacks. 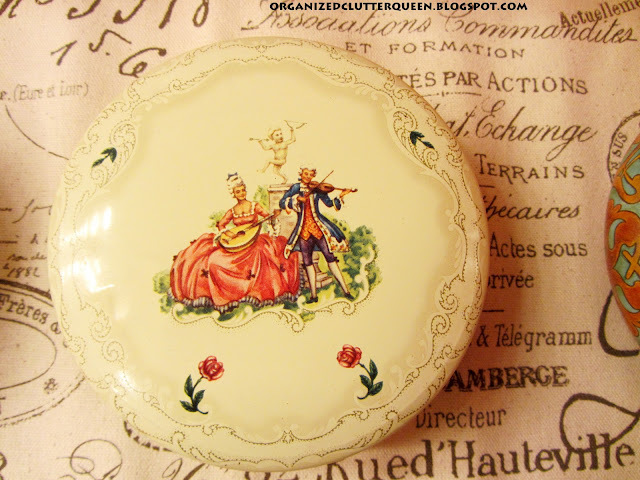 I have some vintage soap and powder tins too. Sadly they are packed away since moving to a smaller house 3 yrs ago. I still think of them though. Thanks for sharing. 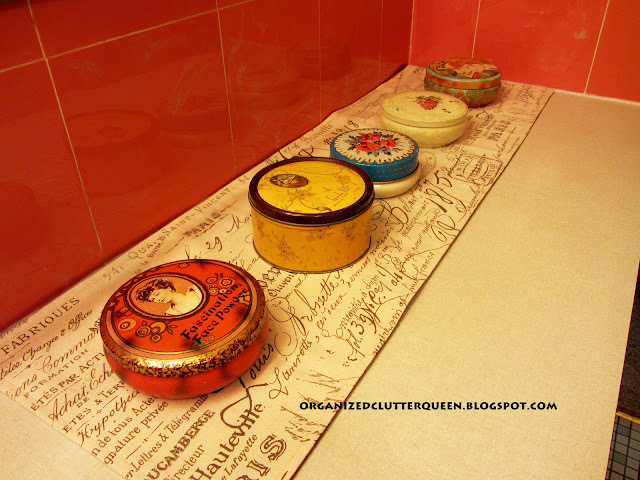 Great tins - they look terrific displayed in the bathroom! Very pretty collection and the way you have displayed them. You've made your bathroom so beautiful! Love your lady heads best, but these tins are beautiful too, along with the plates. I'd like to go "thrifting" with you, you find such great things! Love the vintage tins!! So pretty! I love seeing all the vintage items in your home. This is a great collection and the powder tins are indeed the perfect choice for a bathroom. Thanks for showing them off at Your Cozy Home Party! Wow, these powder tins are beautiful. You have so many too! What a wonderful collection. Stunning! They all look so lovely. 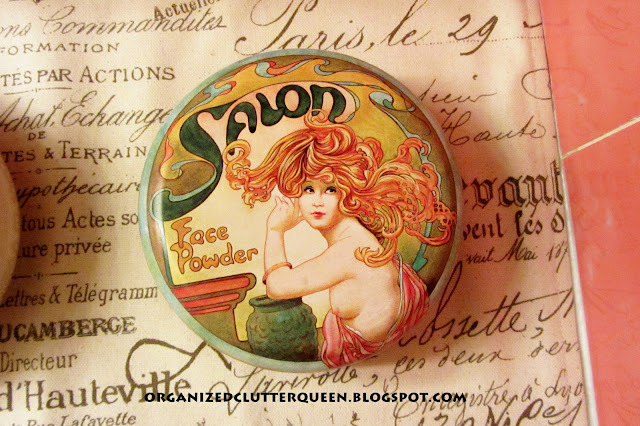 Loving those vintage powder tins...wanna find some! Carlene, I've never seen tins like yours. They are simply precious. Thank you for sharing your collection with us. These are wonderful! I have been trying to add vintage tins to my master bath. I have a couple, but do no see them often. Last week we were vacaioning in AZ. We stopped at an antique store on the way. 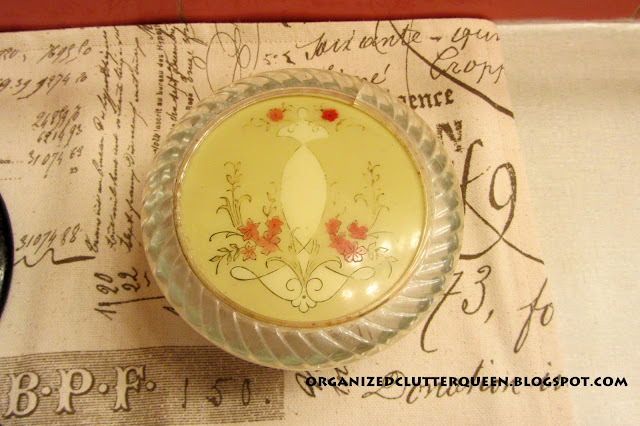 I spied a vintage make up jar with a turquoise lid. I was so excite, until I picked it up and it was $60. A bit too pricey I thought. Maybe I need to check out e-bay. Can't wait to see your reveal. Now a new follower. 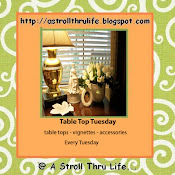 I have a new linky party, Share Your Cup Thursday. I would love if you would link up this week. Very nice collection! I love collecting: vintage children's cups and plates, egg cups and glass or crystal salt shakers. Hugs from Buenos Aies, Argentina! I just found your blog and I love it. 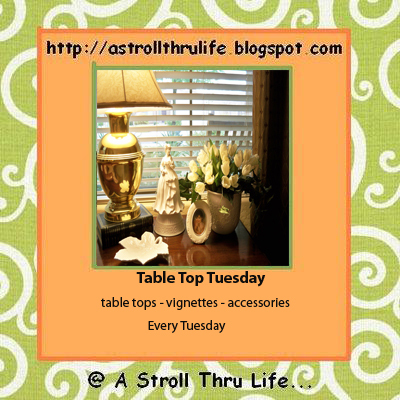 I am always looking for blogs that love the vintage and old. 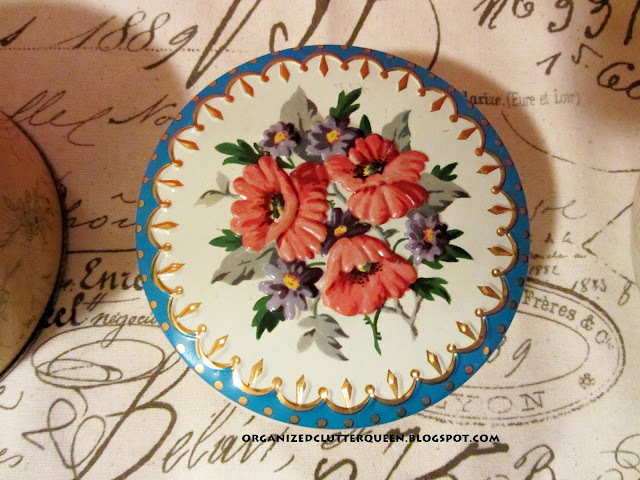 Those vintage tins are just darling! I received that same Fascination Face Powder Tin as a gift when I was about 14. Some "cool" college girl neighbors gave it to me and it started me on a lifetime of collecting and loving vintage, flea, thrift, salvage and design. I sold mine a few years back at a yard sale but seeing yours brought back that fun memory! :) Thanks!